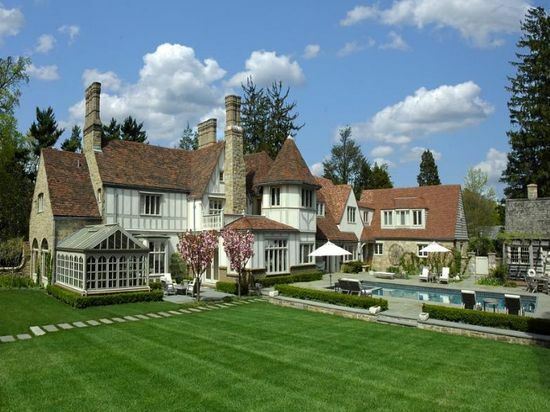 1932 English Manor, Greenwich, CT Elegant renovation and expansion of 1932 English Manor on 1.5 exceptionally private acres in the Belle Haven neighborhood with tennis court, pool and separate pool house with fireplace and full bath. Amazing attention to detail and symmetry. Lovely step-down living room, handsome dining room, library and English conservatory. Gourmet kitchen, butler's pantry, breakfast room and family room with fireplace opening to courtyard and terrace. Five bedrooms, five bathrooms including a luxurious master suite. Beautiful landscaped grounds by Susan Cohen with specimen trees and gorgeous gardens. Romantic wine cellar with fireplace.